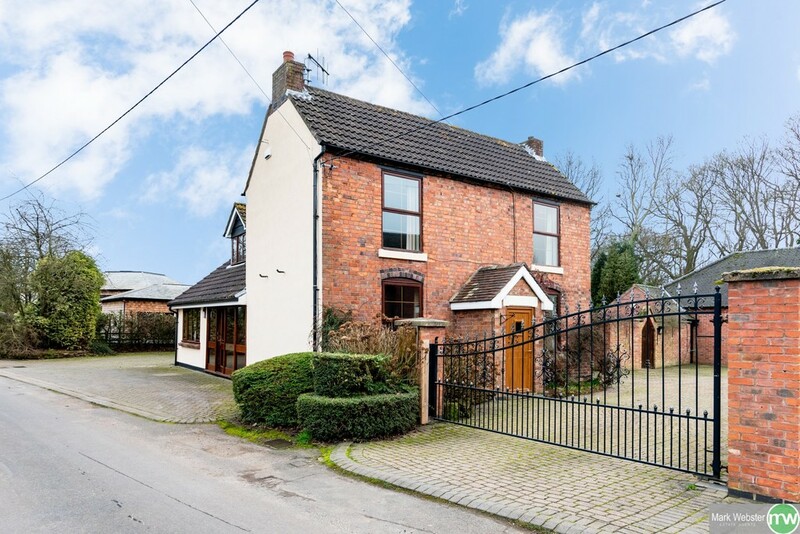 Hipsley Lane, Baxterley - Mark Webster & Co.
Latimer's Rest is a charming detached residence that is located on this quiet Lane in the ever desirable picturesque village of Baxterley. The property stands in delightful gardens believed to be approximately 0.5 acres and benefits from ample parking with the added benefit of a very large double garage with flexible living accommodation above. 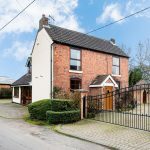 The property is offered with no upward chain and we consider internal viewing to be essential to appreciate the space and range of accommodation this property offers. LOUNGE 28' 2" x 13' 8" (8.59m x 4.17m) Two double glazed picture windows to side aspect, two double panelled radiators, stunning feature fireplace with inset cast iron log burning stove, double glazed bow window overlooking the delightful rear gardens. FORMAL DINING ROOM 12' 5" x 11' 4" (3.78m x 3.45m) Double glazed window to front aspect and a single panelled radiator. KITCHEN/DINER 25' 7" x 10' 0" (7.8m x 3.05m) Double glazed bow window to rear aspect, glazed stable style door leading out to the rear garden, extensive range of fitted base and eye level units, decorative cornice and pelmet, built in fridge, 'Aga', built in dishwasher, granite work surfaces, double ceramic sink with waste disposal unit, inset ceramic hob with extractor hood above, breakfast table area and a door to the walk in pantry. WALK IN PANTRY 12' 0" x 6' 0" (3.66m x 1.83m) Having ample fitted shelving, large cold slab, power and light. CLOAKROOM 4' 4" x 3' 9" (1.32m x 1.14m) Having fitted coat hooks and a door to the guest WC. GUEST WC 3' 8" x 6' 9" (1.12m x 2.06m) Opaque glazed window to side aspect, single panelled radiator, fitted vanity storage cupboards, low level WC and a wash basin. UTILITY ROOM 11' 10" x 6' 6" (3.61m x 1.98m) Double glazed window to side aspect, central heating boiler, fitted base units, work top space and a stainless steel sink. STUDY 11' 6" x 8' 7" (3.51m x 2.62m) Double glazed window to side aspect, single panelled radiator and a range of fitted office furniture. MASTER BEDROOM DRESSING ROOM 12' 2" x 13' 7" maximum (3.71m x 4.14m) Single panelled radiator, extensive range of fitted wardrobes with hidden drawers and shelving, arched opening to the master bedroom. MASTER BEDROOM 15' 0" x 13' 6" (4.57m x 4.11m) Double glazed bow window to rear aspect, double glazed window to side aspect, double panelled radiator, bedroom drawers and door to the additional dressing room. ADDITIONAL DRESSING ROOM 10' 5" x 5' 9" (3.18m x 1.75m) Double panelled radiator, fitted cupboards and drawers, marble work top, glass shelving, recessed ceiling down lighters and access to the en-suite. EN-SUITE BATHROOM 8' 8" x 8' 0" (2.64m x 2.44m) Double glazed window to rear aspect, gold effect towel radiator, his and hers wash basins set in marble vanity top with storage beneath, low level WC, double ended bath with a centre gold effect mixer tap with shower head attachment, tiled shower cubicle and tiling to splash back areas. BEDROOM TWO 13' 0" x 11' 10" (3.96m x 3.61m) Double glazed window to side aspect, double panelled radiator, cast iron feature fireplace, fitted bedroom furniture and a door to the shower room. SHOWER ROOM 6' 6" x 2' 9" (1.98m x 0.84m) Access to the roof storage space, single panelled radiator, wash basin, marble vanity top, tiled walls and a shower cubicle. BEDROOM THREE 12' 10" x 11' 5" (3.91m x 3.48m) Double glazed window to side aspect, double panelled radiator, feature cast iron fireplace, fitted bedroom furniture and recessed ceiling down lighters. BEDROOM FOUR 11' 4" x 7' 8" (3.45m x 2.34m) Double glazed window to front aspect, single panelled radiator and a fitted wardrobe. FAMILY BATHROOM 10' 3" x 9' 7" (3.12m x 2.92m) Single panelled radiator, low level WC, wash basin, vanity storage units, bath with gold effect mixer tap with shower head attachment, tiled shower cubicle and tiling to splash back areas. DOUBLE GARAGE 25' 8" x 25' 7" (7.82m x 7.8m) Having a large up and over electric door, double glazed window to rear aspect, tiled floor, single panelled radiator, glazed wooden door leading out to the rear garden and stairs leading off to the first floor flexible living space. FIRST FLOOR FLEXIBLE LIVING SPACE 12' 8" x 28' 6" maximum (3.86m x 8.69m) A great space that offers a wide range of uses having double glazed Velux windows, fitted double base storage unit, roll edge work surface with a stainless steel sink, wall mounted central heating boiler, single panelled radiator and a door to the shower room. SHOWER ROOM 10' 4" x 5' 0" (3.15m x 1.52m) Double glazed Velux window to rear aspect, single panelled radiator, low level WC, wash basin, vanity storage cupboards and a tiled shower cubicle. GOOD SIZED EXTERNAL OFFICE 17' 5" x 13' 3" (5.31m x 4.04m) Having side windows and an entrance door and a wide range of fitted office furniture. TO THE EXTERIOR To the front of the property there is a secure gated parking area that provides parking for several vehicles and also access to the detached double garage. Located to the other side of the property there is further parking and access to an additional detached garage and gated access to the rear garden. There is a large rear garden that is approximately 0.5 acres in size and has a large Mediterranean style patio with feature pond, good sized lawn and well established borders. ADDITIONAL GARAGE 22' 5" x 16' 2" (6.83m x 4.93m) Having a sliding front entrance door, useful roof storage space, side entrance door, double glazed window, power and light.